I had difficulties doing this. I want to make a sidebar on the right and utilize all of the spaces and margins in one of my pages. Once I added a sidebar, the sections of every page narrowed down. I want to edit the sidebar in cornerstone and add an element to it. Is that possible knowing that I can't edit a sidebar using cornerstone and can't add an element on that area. 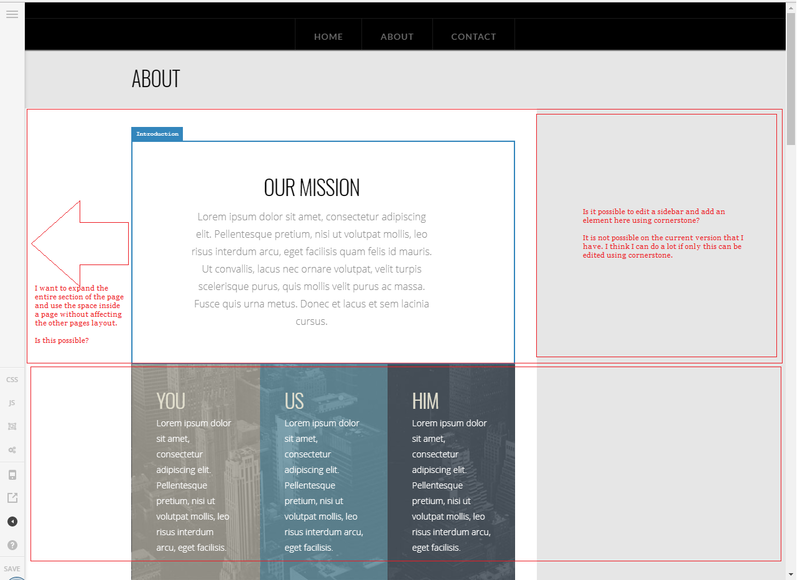 And also I want to expand the borders of the entire section of the page without affecting other pages. I can only expand the sections to use the entire spaces of the page on the customize area but it also affects the particular layout of other pages which giving me a hard time to do what I only suppose to do on one page. The borders of the section narrowed down when there is a sidebar added on a page and I need help to point out how this should be done. I tried a lot of the limited ideas I have but found it not useful. Please help me figure out this changes. Thank you! Sidebar content cannot be edited using Cornerstone. It's content is on Appearance > Widgets Though, we can use cornerstone element shortcode on the sidebar. See shortcodes here. The entire page container is controlled on Theme Options/ Customizer. Yes, that settings is for every page of the site. We can override that setting using custom CSS instead. Change 69 to your specific page id. Thank you so much! It works! Thanks to all of you! You're welcome and Happy holidays!